I’m a day late on this one, but I think I’ve got my line problem taken care of. I haven’t gotten the DVD working yet, but that will be after I get this out. This is more important. I got up this morning around 0815 in good shape, even though I forgot to take my aspirin. I didn’t really think I would need the aspirin because it was only 1 liter of Red Horse and I had so much BBQ chicken and rice it just absorbed all the alcohol. I have already had a cup of the new coffee Lita got for me. It’s Nescafe 3 in 1 strong coffee, so now I don’t have to use 2 packages of coffee to make 1 cup. This one will do, but when I get a chance I will get some more of that San Mig extra strong coffee that I had before that Lita accidently purchased in Tacloban. I’m glad she did though, I really like it. 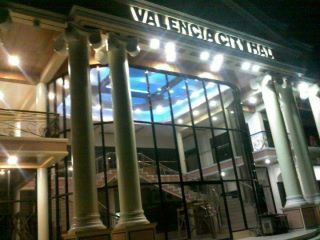 Valencia is a 2nd class city in the province of Bukidnon, Philippines. 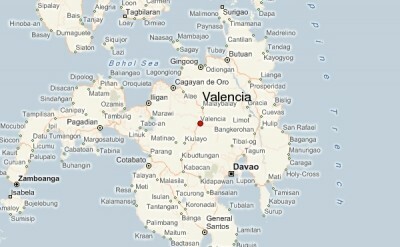 The City of Valencia is located at the heart of MIndanao. It is bounded on the North by the Municipality of Lantapan and the City of Malaybalay; in the south by the Municipalities of Maramag and Quezon and in the east by the Municipalities of Pangantucan and Talakag. 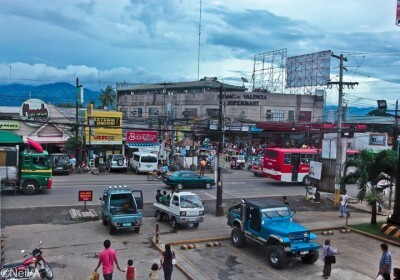 The City comprises 31 barangays. Barangay Poblacion, wghich is the seat of the City of Malaybalay. It is 118 kilometers southeast of Cagayan de Oro City or two-hour ride by land transportation; 169 kilometers from Davao or five-hour ride and 234 kilometers from cotabato City or six-hour drive. Valencia rises 373 meters above sea level, the City is characterized as generally wet throughout the year with a short and slight dry spell lasting likely within the months of december to April, except January, which is sometimes a rainy month. 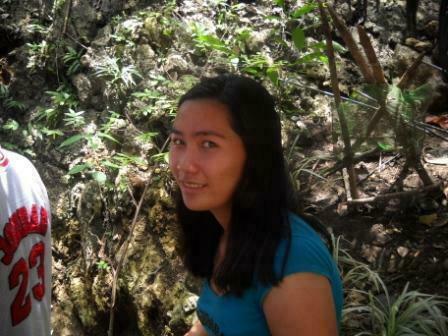 The Valencianos enjoy a good climate year-round since the City is outside typhoon belt. The City of Valencia has a generally flat topography and is partly rolling. 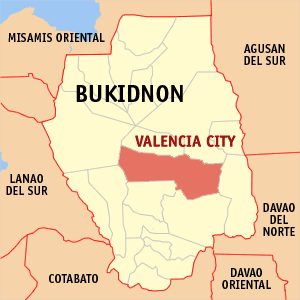 Valencia City is located in the province of Bukidnon in the island of Mindanao and within Region X. Globe showed up about 0930, but they didn’t have anything to fix. I’ve had no problems with the Internet for quite a while (knock on wood). I only left the order open for them to still show up because of the constant intermittent problem I”ve been having. They just stayed a few minutes asked a couple of questions and called to close the work order. I’ve had no problems since that time either. Today was the day that I was suppose to meet Rick at the SO Cafe. At 0938 I saw the clock and I told myself, self I said, “You have to start getting ready in about 30 more minutes if you want to make it on time”. No one listens to me, not even me, I guess. What seemed to be like 10 minutes, it was 10:29. I was getting ready to go anyway when Lita came in and told me that one of the workers, Tex I think, told her that Rick (he called him Mr. Smith), was already at the Cafe. Well Crap! I have no cell phone number for Rick, so I couldn’t call him, but I figured he would figure out pretty soon that I’ve wasn’t going to show. SORRY RICK!!! We can do it some other time. It’s not like there won’t be other opportunities, or at least I don’t know of any problem with the Earth’s gravitational pull or any other pending disaster. So I went back to typing up some of yesterday’s post because it was a long one and I was trying to do it a little at a time. I’ve got 4 Philippines news sites set up here and I like to check them a few times everyday so I can try to get y’all any important Philippines news, hopefully before any other websites do. Right about 11:45 I hear a semi-loud tapping on the bedroom door. Precious is there yelling something, but I have no clue what she is talking about. Whatever it is, she must think it’s important because she is very consistent at tapping & yelling and she won’t go away. So I had to get up to figure it out, or she might be there all day. As it turned out, Lita sent her to get me because it’s my turn in LolyKat. So at 11:50 I’m sitting out here and I’ve go the door closed to keep out the rampaging rug rats (or concrete critters in this case). It’s not so hot today because it is an overcast sky and in fact it started raining about 12:45pm. It was a slow, steady rain and I was hoping that it would last all day long, just like that. I was only out in LolyKat until 2:00pm and Lita woke up from her nap to replace me out there. I stayed on the computer for most of the time in the house, until about 7:00pm. At 7:00pm we went to Judith’s house for Grace’s 19th birthday. To me it seems she just turned 18 a few months ago, so that’s not good. I want it to seem like it’s was a long time since her birthday. Time is moving too fast. When we got there, we found out that the owner of the house gave them notice to move. They must be out before the end of May. Dang! That’s enough time to figure something out, but they don’t really have anyplace to go and probably not enough money to do anything. Right now the plans are for them to stay in our compound and sleeping arrangements will be made. We have been hoping that they would get here eventually because we want to open the Blue Gazebo and Judith is suppose to be in charge of that, but we’re not ready yet. I was hoping we would be, but it won’t be until we get back from Texas, at the very least, unless something spectacular happens. If they have to, they could always move back to Catmon, but after living in the ‘big city’, I don’t know if they would really like living there again. There is not much to do there at all. Watching paint dry and grass grow are popular past times there. 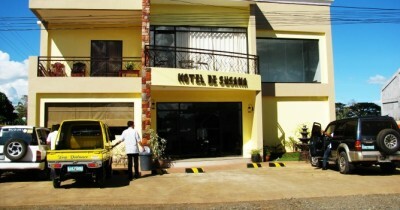 Oh, okay it’s not that bad, but compared to Calbayog, it would be boring. On the way home I asked Ado about the Hope Cafe that I took a picture of before. I was wondering at the time if it was open or closed down. It was not open when I went by. We were only a block away, so we drove by and the place was hopping. It was about 9:20pm and there were a lot of young adults hanging out there. Even more interesting on our trip home, it was the first time that I have ever been in a vehicle that actually had to stop for one of the PNP checkpoints. There is not normally a checkpoint on our way home, but I hear that the Governor and a couple of other distinguished VIPs will be at the Ciriaco the next day, so they are checking for early bird terrorists I suppose. That’s okay with me since we live right across the street from the Ciriaco. I wouldn’t want to get caught in any crossfire. At the checkpoint they kind of smiled when they saw me and just asked where we have been and where we are going. I told him that we were in Calbayog and we are going home. We are all in Ado’s multicab, so they looked in the back and saw mostly children. Lita told me later that is actually what they said, “This thing is full of children”. As it turns out, one of the policemen is a friend of Ado’s & Cathy. In fact, he is Crystal’s ninong, so us getting through was a pretty simple task. When I got home I went to see Ramil, but he did not have the installer. He said they tried to get it today, but couldn’t. He will try again tomorrow. I figured if he didn’t get it tomorrow, I will just use my Windows XP Home Edition that I have. I’d rather have the Pro, but I can’t stand these damn lines anymore. (He does get it the next day, but I will have details on that in tomorrows post). I’ve decided to eliminate the mjts.john e-mail address. If you have any questions for me that you’d rather not put on the site and/or you are interested in some of our tours, then please use my new e-mail address: johnwjr7@texaninthephilippines.com . Useless Knowledge: The first woman executed by the U.S. government was Mary Surratt . She was hanged July 7, 1865, for conspiracy in the assassination of President Lincoln.